ALL ABOUT DAEGU: Chasing Spring + Where To Go + Where To Stay + How To Go Around, Etc. I am a country repeater. Never thought I'd type that four or five years ago. I've always been the type na mag hihinayang if I go to same places again and again--instead of spending the travel budget to see a whole new place. But then again, am I seeing the exact same things whenever I go to Korea? Well not really! I am so used to people saying "KOREA NANAMAN!?" or "Tumira ka na kaya dyan?" HAHA! But they don't understand, I cannot afford to live in Korea yet HAHA! The most is 10 days. Also, it's not as if I go there just to see the same places again and again. Masawain akong tao by nature. First, there's the different seasons that we don't have here so I still enjoy them (winter, spring, and autumn). And secondly, I choose to focus on different cities on my every visit. For Spring of 2018, my 7th time in South Korea, I decided to go to their non-touristy city which is DAEGU. I have to admit, I started from scratch on the day I began researching about Daegu. There were little travel blogs about this, especially from Pinoys. My only background of this city is that it was a setting in the Kdrama Oh My Venus. Other than that, I am totally clueless! 1) It is the fourth largest city in South Korea, making an effort to be known for their fashion industry. 2) It is only 1 hour and 40 minutes from Seoul via train. 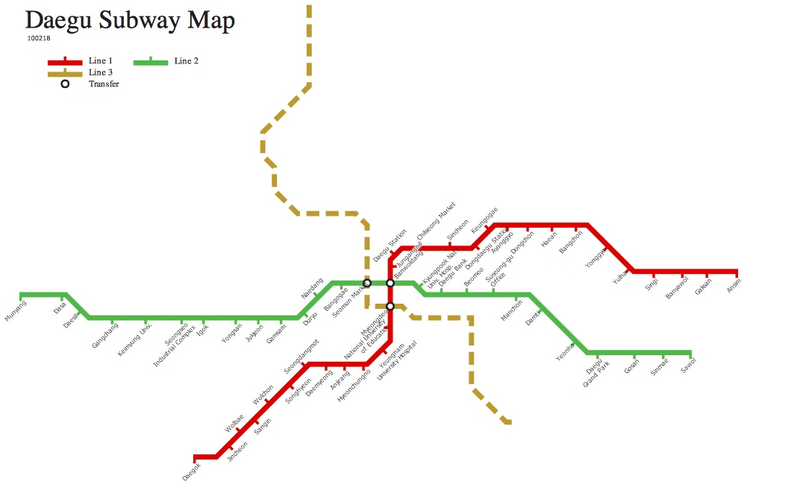 3) The local Daegu Metropolitan Subway only has THREE lines, so it's less complicated to commute here via Seoul. I also use the same T-Money Card (reloadable) that I use in Seoul when commuting here. They also have buses, although I had a hard time understanding it even though I follow the numbers. Daegu also has an airport for local and international flights. 4) Daegu is hometown to several popular Korean celebritites, including BTS' V and Suga, Irene of Red Velvet, and actress Song Hye Kyo. 5) They have really interesting festivals that you might want to coincide with when you plan a trip here, including the Dalgubeol Lantern Festival and a Chicken and Beer Festival! How To Go and Where To Stay in Daegu? I have a separate blog post on my KTX experience from Seoul to Daegu, and my affordable guest house while in the city. How To Go Around Daegu? From my research, Daegu has two main mode of transportations for your tour: one is the Daegu City Tour Bus. I wasn't able to explore this option, but it looks convenient since most of Daegu's tourist destinations are included in the stops. But since I am more of a train / subway girl (haha), I explored Daegu by hopping on and off their easy train system. 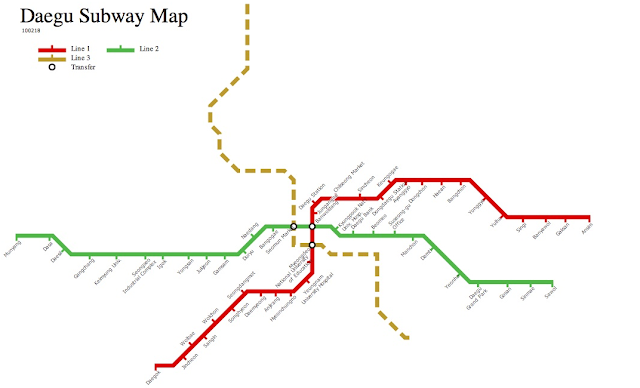 If you can navigate the more complex Seoul train stations, then Daegu's three main lines will be a piece of cake! Click to enlarge photo. Point of entry via KTX is Dongdaegu Station. Ideally, I recommend the area where I stayed in for first timers, it's the main hub of the city much like Myeongdong or Hongdae of Seoul. It is near Jungangno Station, or Downtown Daegu. On my first day, I arrived around 4pm already but was able to go to E-World Theme Park from late afternoon to nighttime. It amuses me that schools are tourist destinations in Korea--parang Ehwa University when you're in Seoul. Keimyung University in Daegu is a huge campus with beautiful buildings, parks, and even a cultural village, I won't even think it's a school! I went there on a Sunday, so there were few people to almost no students around. Kinabahan pa ako nung una bakit walang ka-tao tao at may nag aaral ba talaga dito when I realized na oooh SUNDAY nga pala!!! Hehe. The best part is, Keimyung University is also the prestigious Shinhwa High School in Boys Over Flowers! If you're not into Kdrama, then check out the Keimyung Culture Village inside the campus. I think I also saw my first cherry blossoms for this Daegu trip in this area! Also on the same station as Keimyung University, and just in time for lunch, I decided to visit the (former) restaurant BTS Suga's mom. Name of the place is "Big Hearted Grandma’s Blood Sausage Soup", but take note that the signage is in hangul so iminemorize ko na ang shape and color scheme ng signage and building (haha). From Youtube videos of past ARMY tourists who've visited this place, on-display inside the resto were BTS albums, official light sticks, posters, dolls, and other merch. Parang may mini museum! Tapos they play mostly BTS songs in the resto! After a long walk though, the place is sadly closed on that day. Saklap! I took a peek inside and mukang wala nading any signs of BTS, heard that it's already sold to a new owner. I decided to just grab a sandwich in a convenience store, huhu. If I've had arrived earlier on my day 1, I can easily visit Duryu Park and E-World Theme Park in one day as they are just next to each other as in isang tawid lang. Duryu Park is just an ordinary park where locals hangout, but I enjoyed going around to take artsy shots of spring time blooms with Daegu's 83 Tower as backdrop. I think dito ako qumouta ng bulaklak shots! Haha! It's also in Duryu Park where I encountered someone who introduced himself as a street photographer in Daegu. He asked permission to take my pictures while taking photos under a tall cherry blossom tree. Ganda ng shot! It's a huge park and I don't think I was able to go around the whole length of it. Next time, bring a few snacks and drinks so you can chill by the benches of this huge park. It's not my first time to watch a movie in Korea without the subtitles, but this time I am more familiar with the plot since I've already watched the series version. Yung first one ko was in Seoul and sobrang clueless ko, it was an action movie but kamuntikan nako makatulog sa pagod hahaha! After all the walks, it's nice to relax and add something chill in your itinerary without wasting your time. And I think going to the local cinema complete with a bucket of popcorn is one of them!! I think it's also CGV's opening day of Cheese in the Trap, and I heard from friends online that the cast even went to Daegu to promote the film (Park Hae Jin HUHUHU! Sandara!!!). Sayang hindi ko sila naabutan kung anong CGV yun but for sure punong puno nadin naman sya! Anyway, although I already know the story it's so hard to catch up on some scenes lalo na when they're telling a joke and the girls next to me were all laughing so hard halasha di ako maka relate hahaha! Favorite scene ko, and you know marami to sa Cheese in the Trap, is when there are jump scares dahil dun ako nakakabawi sa reaction! Gulat kung gulat, hahaha! How To Go: Found several CGV branches in Jungangno Staton! This is my "neighborhood" in Daegu, where Kbeauty shops, restaurants, local and imported boutiques, and CGVs sprout here and there. It's the Myeongdong slash Hongdae of Daegu, where most people go to at night or on weekends to shop and hangout with friends. Just by going around Dongseongno in Daegu will get you a glimpse of the city. Aside from the visible shops, they also have a small park, a Cafe Alley, a lane of vintage stores aka ukay ukay, an underground mall, nightly street performers, and nearby museums such as the Daegu Modern History. Again, if I ever have the chance to visit Daegu, I will most prob still stay here since it's central and they have a lot of things going on that I have yet to explore! Discovered a street with just VINTAGE stores! Siguro kung kasama ko dito si Pax tapos wala pang luggage allowance limitations, walang pigilan sa shopping to! A few blocks away from my guest house, they have a street called Cafe Alley! In love with the park just outside Daegu's Modern History Museum. Went there on a Monday so the museum is closed, sayang. But the trip was not in vain as outside, cherry blossom and other spring blooms filled the park! Sobrang gandang ganda ako while the locals just pass by in the area at normal nalang sa kanila ito, hehe! Imagine having this sunny but not hulas weather kasi malamig padin? Tapos may magandang park walking distance lang sa area nyo so you can just chill at mag muni muni .... nakaka inggit! On my last full day in Daegu, I decided to go on an adventure! It was hard for me to navigate the city through bus, but I tried harder for this nature trip so I can visit Daegu's largest eco-urban park Mt. Apsan. My game plan is just take the cable car to reach the observatory and admire the wonders without the hardwork (lels), but I did not realized that (AS USUAL!) just going to the cable car already entailed a HIKE! Haha! Hindi na ako natuto na pag dito sa Korea, ang walking distance is gapang in my context! Hahaha! Had a hard time looking for the bus from Anjirang Station's exit. But I just asked around, double checked with the driver, before riding the bus. You can use your T-Money or pay in cash. Quick stops and OOTDs everytime I see benches. Kita naman naka skirt pa ako, di ako ready!! After navigating with my map, checking all the signage, and asking people that I encounter along the way, I finally saw the foot of the cable car heading to the observatory. Akala ko pa nun una sarado coz walang tao! Hahaha nakakaloka. Anyway, the cable car is on the dot, I got a roundtrip ticket by the booth for 9500KRW. More walks to get to the observatory. I just followed the family in front of me. Cannot imagine going here at night although online reviews say that the city lights are more beautiful by then! Hindi kaya madilim na yun?? On another route opposite the observatory, there's a resto where I had my lunch. The owner also told me they have their own observatory upstairs, kakaloka meron din naman pala dun! Hahaha! The food is good, I ordered kimchi noodles na sobrang laki ng serving size, served cold, and had that right amount of spice! Since it's a spring trip, my next agenda was another park. Also, it was a full Monday where most public establishments such as museums are closed in Korea, so talagang outdoor ang game plan. I am not sure how I ended up with Sincheon Riverside Daebong Gyo, but it's one of those Daegu parks in the list where you can see cherry blossoms, and one that you can easily go to by just riding the train (wala nang bus). True enough, I fell in love with this simple park by the river. People ride their bikes or jog by the water, or just hangout by the benches. I also saw a few blooms here and there. My last stop for this trip is another park, but this time it's the one featured in the Kdrama Uncontrollably Fond. I just saw this online, but had no idea which exact scene was shot here. I just guessed that it might be the one where there are cherry blossom trees in a park, and where Kim Woo Bin's head was just resting on the lap of Suzy Bae. Huhu, I just loved that scene and the whole series! Lahat ng tao iniluha na sa Scarlet Heart ang feels, but ako hindi ko alam bat sobrang affected ko sa Uncontrollably Fond! Magang maga mata ko the next day, ganung level ang lungkot ko yung tipong di ka na makahinga hahaha! Anyway, aside from being a free park with lots of benches to rest, Dalseong Park also has a free zoo inside! I am not a fan of zoos now because of all the information you will learn about them over the internet, like how the animals are sad when not in their natural habitat and just locked in a small cage, huhu. I left the place after watching the sunset, and realized it's my last sunset nadin in Daegu (for now, huhu) since I am leaving for Seoul by lunch time the next day. Feeling ko talaga this is where the Uncontrollably Fond scene was shot, hehe! Although hindi pa full bloom ang mga trees. Naka huling hirit pa ako in the morning before my train ride back to Seoul. I got lost going to The ARC Cultural Center of Daegu the night before because of the confusing bus system, and so the next day I decided to take a taxi instead (coming from the nearest train station). The ARC Cultural Center is a fairly new structure in Daegu, comparable to Seoul's Dongdaemun Design Plaza na sobrang standout ang style. It looks like a huge boat from afar, and since it's near a body of water, it looks like it's floating! Inside, you can freely roam around the free museum mostly on water and how they designed and built the ARC. Onti lang tao when I went there, and also, napakahirap na kumuha ng taxi when you want to leave na!! Akk! TIP: Arkila ka na ng taxi na balikan when you go here. I had to WALK to the train station for about 20 minutes kasi madalang din ang bus dito (although meron). How To Go: Daesil Station Line 2 Exit 2. There's a bus stop but di ko mahanap anong bus. Take a cab instead, it will cost just about Php 250! If I can re-do my trip here, I would also ask for the taxi driver to wait for me na and take a quick tour and photo ops of the ARC. So that's it!! Even with lack of online references, I think I did okay naman for a Daegu first timer? In a way, I appreciate this city more the moment I got back in Myeongdong. Ang sikip ng trains and streets and soooobrang dami na talagang tourists. And although almost same naman sila ng itsura from trains and shops, iba yung feel ng pagka chill ni Daegu. Sabi ko nga sa isang IG story ko it feels like Alabang (where I live), while Seoul is Manila. It's a good break from the fast-paced city life of Seoul, and exciting pa sya kasi something to discover for myself without much online help. There will always be a special place in my heart for Daegu, after comparing it to Alabang--it indeed felt a bit more like home. I didn't know you're from Alabang! South represent lol. I followed you along with your IG story pa but it's so nice to read the written words as well with the still photos! Ang ganda ng Daegu. I didn't think I'll be a country repeated too but I want to go back to Korea to explore more - all the seasons except summer and a lot of other cities haha. especially when you visit the sights and scenes from famous K-Dramas.